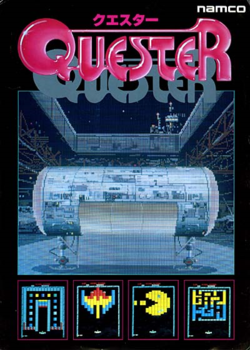 Quester (クエスター, literally Kuesutā), is an arcade game that was released by Namco in 1987 only in Japan. It runs upon Namco System 1 hardware, and represents the company's response to Taito Corporation's Arkanoid (which was released in the previous year); however, its graphics and sound are considered superior to both the game it is based on and its immediate sequel, Revenge of Doh. A second version of the game, titled Quester: Special Edition exists, and was also released only in Japan; it features several new rounds, and many of these new rounds are based upon older Namco characters, such as Pooka from Dig Dug (1982), and Princess Ki from The Tower of Druaga (1984). As with many other ball-and-paddle games (including Namco's own Gee Bee trilogy), the player must take control of a paddle at the bottom of the screen, and move it left and right to deflect a ball into the formation of bricks above it (and if you can keep that ball in play for a preset period of time, it will split into three balls) - certain bricks will also leave powerups when destroyed that will increase the size of the paddle, generate several extra balls in force-field when the initial ball goes into it and even create a line below the paddle that will prevent the balls from going out of play when collected. The seventh, fourteenth, twenty-first and twenty-eighth rounds are also "bonus rounds", where you have to destroy all the bricks in the formation within a preset time limit (unless all your balls go out of play); the thirty-third and final round is also a "boss round", where you are up against "Burida" (who is protected by a metal wall with a vulnerable spot on its top side, but does not attack by spitting lethal mirrors like Doh did to both Vaus in Arkanoid and the human Bubblun & Bobblun in Rainbow Islands). Once you have hit that vulnerable spot on the top side of the wall five times, it will leave Burida vulnerable - and once you have hit him, you will receive 100000 points for every life you have left and the game will be over. First round of the game. This page was last edited on 21 October 2016, at 08:30.